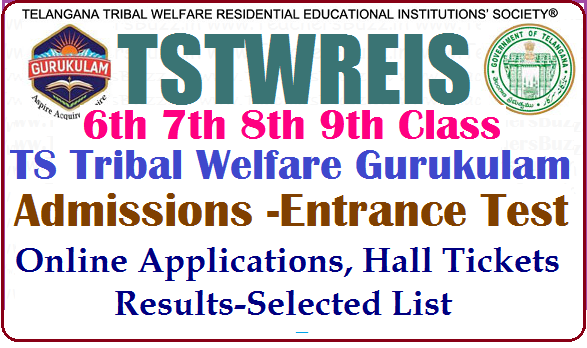 Admission Test for classes VI,VII,VIII,IX for the academic year(2018-19) : TSTWREIS Tribal Welfare Gurukulam 6th 7th 8th 9th Class Admission test 2018 Results , Merit List download: TSTwreis TS Gurukulams 6th, 7th,8th, 9th Class Entrance test 2018. Telangana Tribal Welfare Residential Educational Institutions Society Backlog Vacancies in VIII Class (In Khammam, SOE) VI,VII,VIII,IX Classes (Backlog Vacancies) for the academic Year 2018-19. TSTWREIS /Telangana Tribal welfare School 6th/7th/8th/9th Class Online Application 2018 forms tstwgk.cgg.gov.in tgtwgurukulam.telangana.gov.in . TS GURUKULAM 6th/ 7th/8th/ 9th Class Online Application 2018. Telangana State Tribal Welfare Residential Educational Institutions Society(TSTWREIS) Hyderabad released the 6th/7th/8th/9th class admission test 2018 notification and TSTWREI Society would be invited the online application forms from the eligible students for admission into all TSTW Residential schools for 2018-2018. TSTWREIS CET 2018, TS Girijana Gurukula Vidyalays, Application Form, Eligibility, Selected List, Hall Tickets, List Of Documents details are provided here. a) For 6th Class: SC / ST students should have born between 01.09.2004 to 31.08.2008 and OC / BC / SC-Converted Christians (BC-C) should have born between 01.09.2006 to 31.08.2008.
b) For 7th Class: SC / ST students should have born between 01.09.2003 to 31.08.2007 and OC / BC / SC-Converted Christians (BC-C) should have born between 01.09.2005 to 31.08.2007.
c) For 8th Class: SC / ST students should have born between 01.09.2002 to 31.08.2006 and OC / BC / SC-Converted Christians (BC-C) should have born between 01.09.2004 to 31.08.2006.
d) For 9th Class: SC / ST students should have born between 01.09.2001 to 31.08.2005 and OC / BC / SC-Converted Christians (BC-C) should have born between 01.09.2003 to 31.08.2005. 2) All the ST (Boys & Girls) should belong to all 10 Districts of Telangana State should have studied continuously in the respective district for the two academic years (2016-17 and 2017-18 in a TW Residential Schools, Ashram Schools, Govt. Schools and other Govt. Recognized schools. 3) During the year 2017-18 candidates must be studying 4th class continuously in a Government school or in a recognized school. 4) The parental income for the year 2017-18 should not be exceed Rs.1,50,000/- per annum for rural areas and Rs.2,00,000/- for Urban areas. 5) The candidates can apply to any TSTWR School of the district for which he / she belongs. Hall tickets download the from the website after submission of online application form.